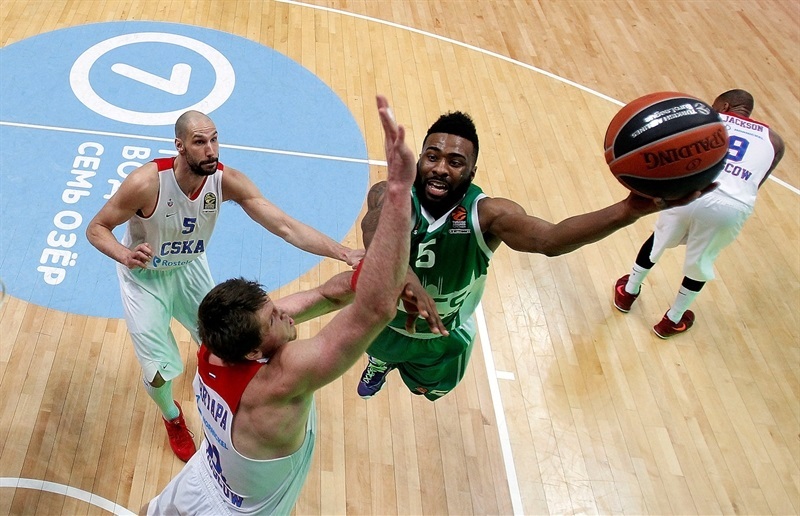 CSKA Moscow’s All-EuroLeague guards were in superb form Friday to lead the team to a 74-85 road win at Unics Kazan. 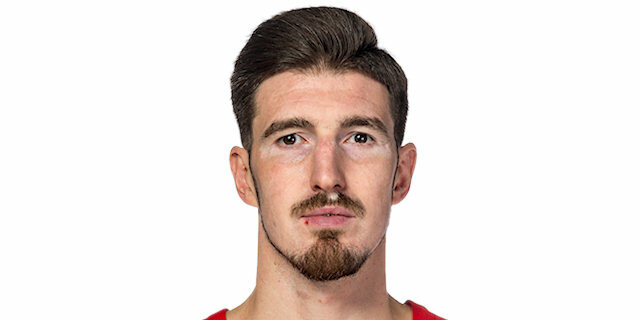 Nando De Colo won his showdown with the EuroLeague’s top scorer, Keith Langford, by scoring 22 points, while the league’s assist leader, Milos Teodosic, tallied 12 points and 12 assists for the champs. 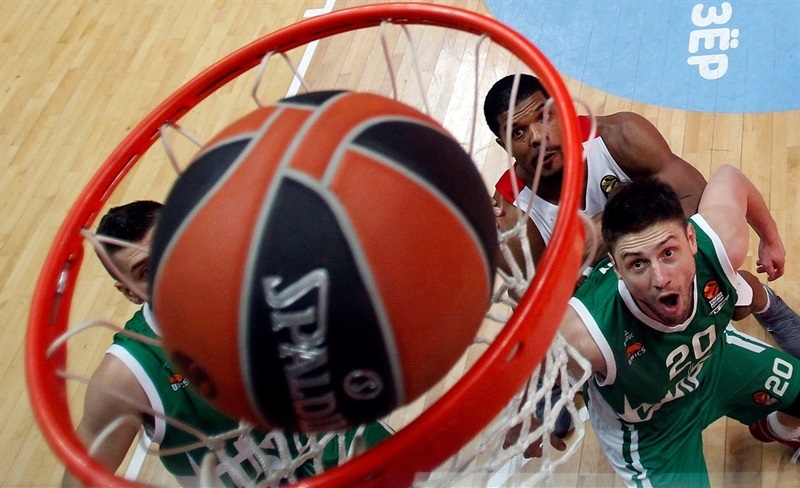 The victory lifted CSKA to 21-7, while Unics lost its 11th straight game to fall to 7-21. 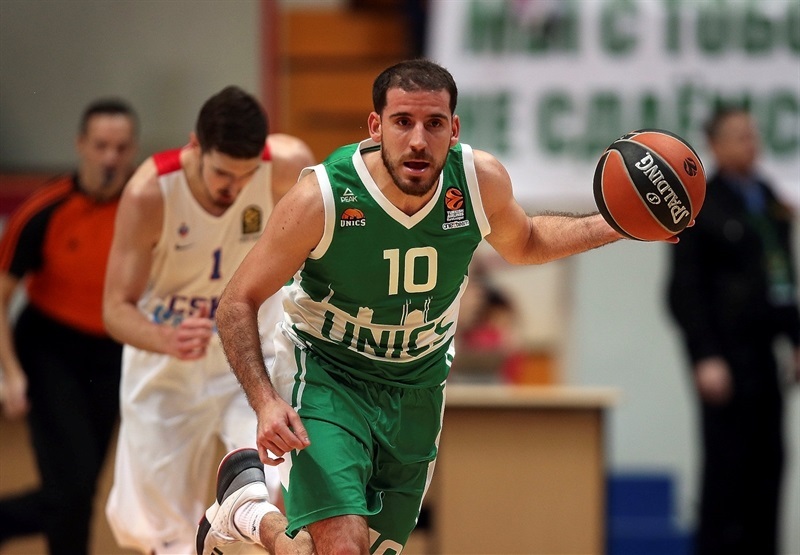 What’s more, Unics may have alos lost starting point guard Quino Colom, who was helped off the court in the second quarter with an apparent ankle injury. 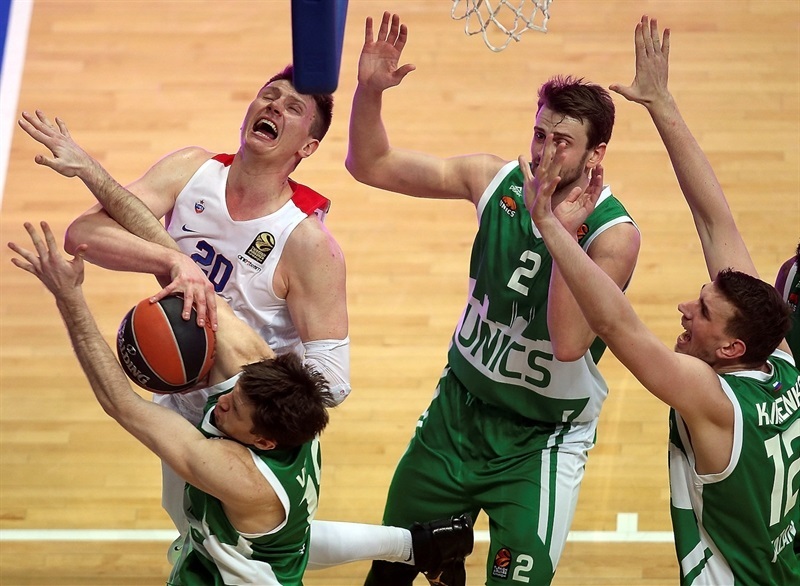 CSKA overcame its 17 turnovers by shooting 6 of 12 from downtown in the second half and outrebounding Unics 30-35. Langford paced the hosts with 17 points, Anton Ponkrashov added 16 points and 7 assists and Art Parakhouski posted 14 points, 8 rebounds and 3 blocks. 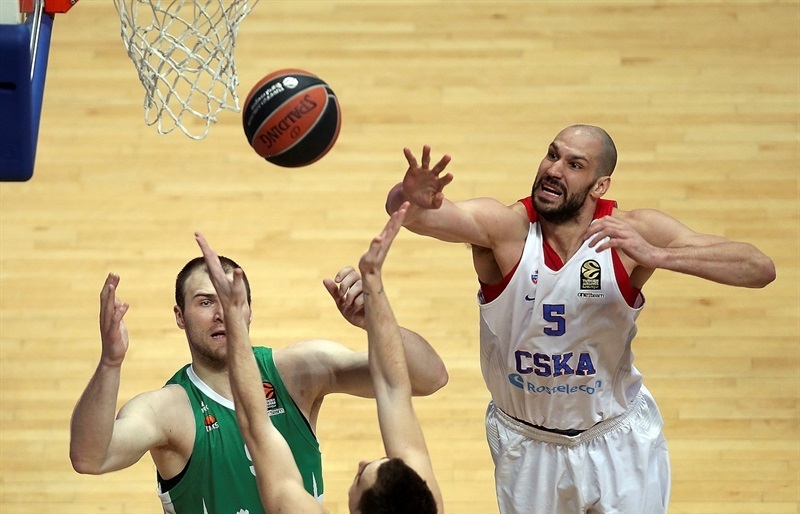 CSKA got off to a 0-6 start before Colom darted into the CSKA defense for a three-point play. Great passes from Teodosic for the visitors and Colom for the hosts led to baskets in the paint as Unics remained close. Kyle Hines netted 3 free throws and collected steals that led to a Nikita Kurbanov layup and a De Colo reverse layup-plus-foul as CSKA’s advantage blossomed into double figures. Kurbanov split free throws to cap a 0-9 run that made it 7-19. Unics fought back with 7 straight points, the last of which came through a Ponkrashov triple, before CSKA used a timeout. Artem Klimenko’s put-back completed Unics’s 9-0 run. After a series of free throws and a Cory Higgins three-pointer, CSKA led 18-25 at the end of the quarter. 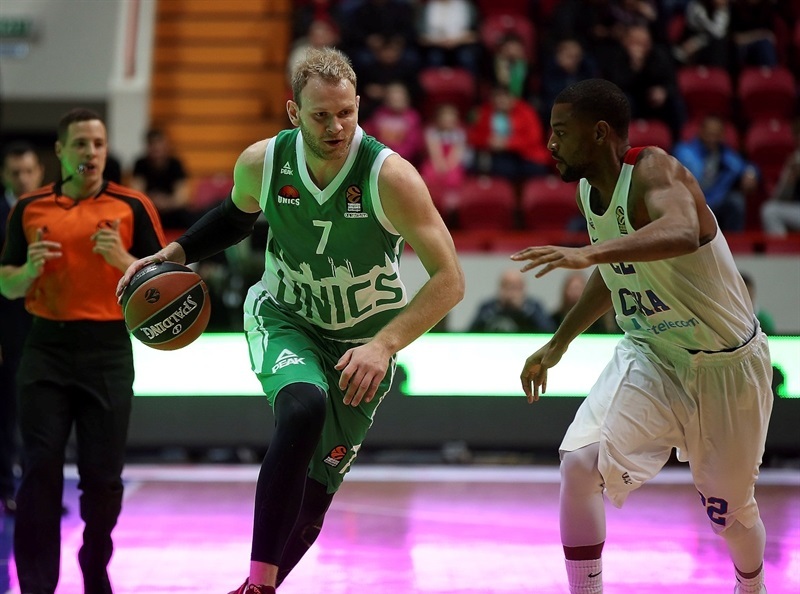 The teams traded points in the early minutes of the second quarter with Unics staying close behind. 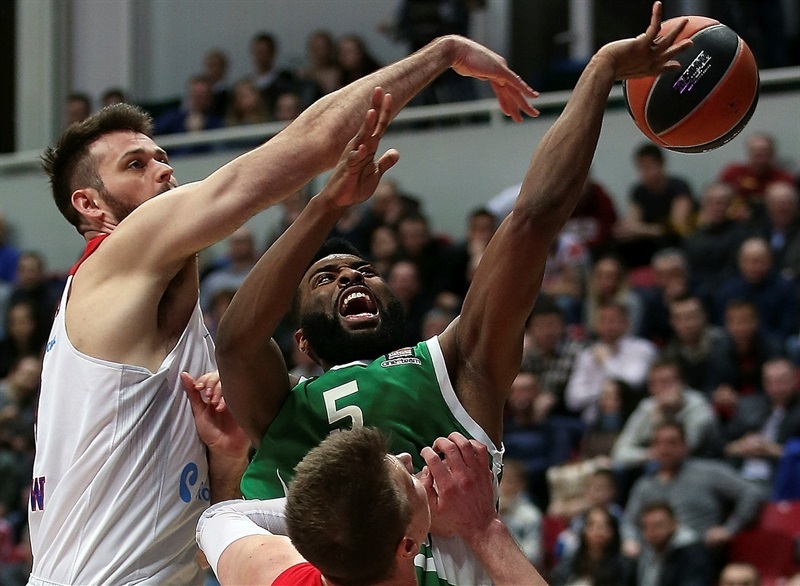 Keith Langford got going with free throws and an assist to Parakhouski to draw Unics within 28-31, but the hosts lost Colom. 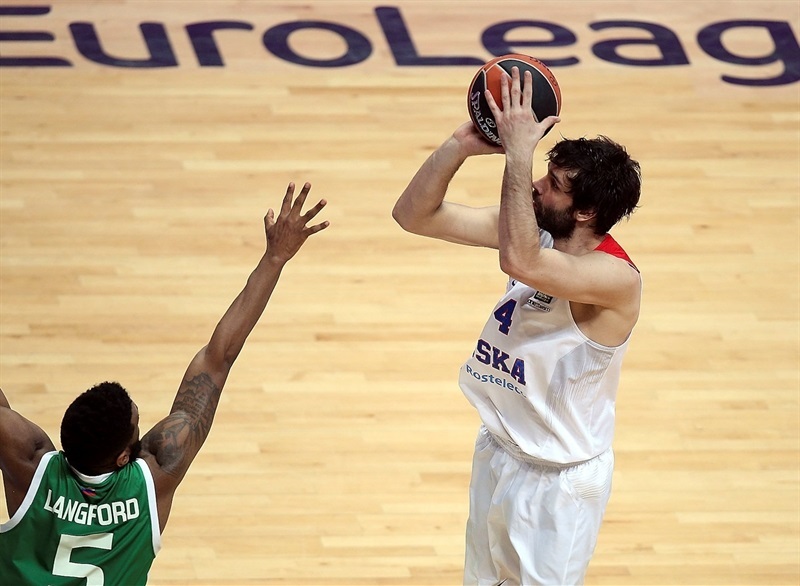 Teodosic recorded 3 assists on as many possessions as CSKA boosted its margin to 30-40. Andrey Vorontesevich added a three as the visitors grabbed a 33-44 halftime advantage. Langford and Teodosic traded threes to start the second half. 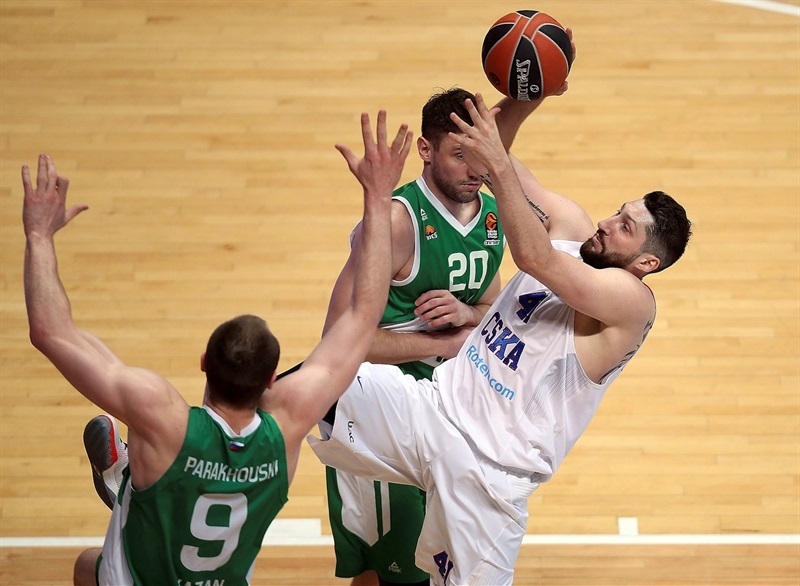 A Parakhouski slam got Unics to 40-47. 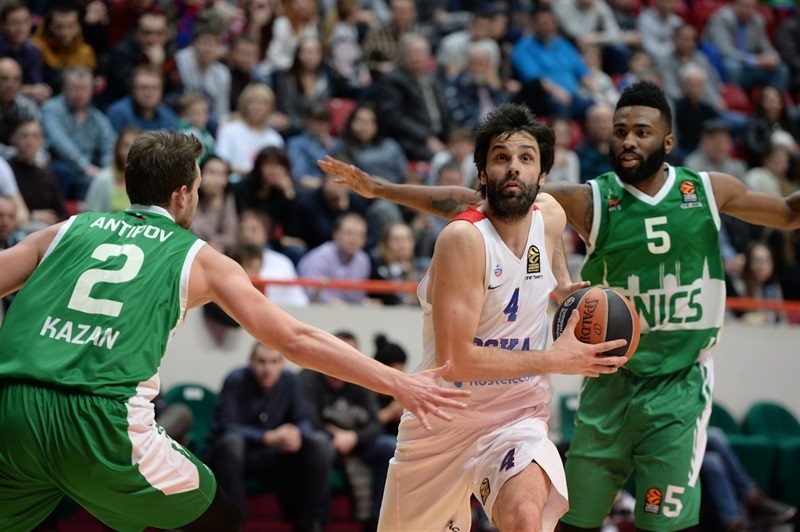 Lanford’s second triple made it a 6-point game, but Teodosic hit a three and dished 3 assists and De Colo added 5 points in a 0-11 CSKA surge for a 43-60 lead. Despite the best efforts of Ponkrashov and Langford, CSKA continued to add to its lead, which reached 20 after a pair of Aaron Jackson free throws. Ponkrashov made it 57-74 through three quarters. 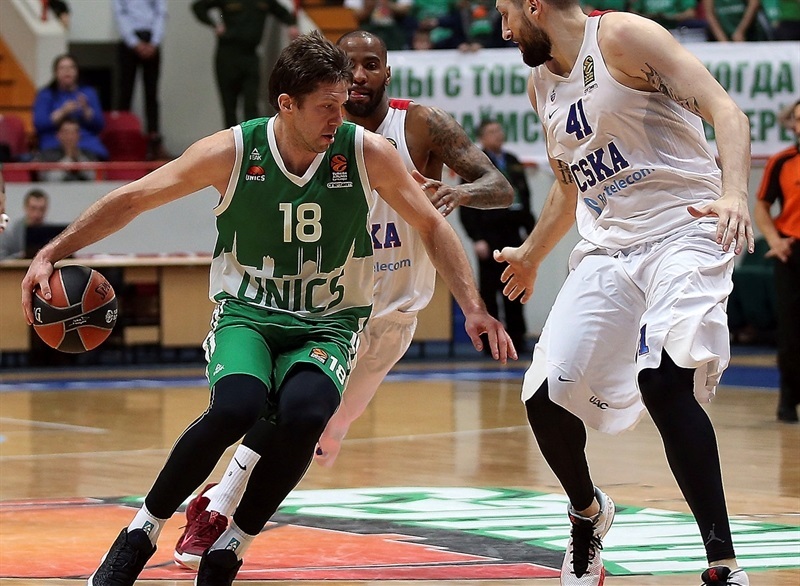 Unics scored the first 6 points of the fourth quarter and eventually trimmed the margin to a single digit on a Danilo Andusic triple, 67-76. Hines countered with a three-point play and CSKA seemed to have an answer for each successive Unics basket. Langford was called for a technical and fouled out with just less than two minutes remaining and CSKA held on the rest of the way. "For us it was big motivation to play against CSKA. CSKA for us always is a red color, big team, champions of EuroLeague. We were ready to fight and some guys showed good defense. We started with turnovers, gave up rebounds. We were afraid them a little bit in the beginning. In the second quarter we came with Artem Klimenko, Anton Ponkrashov, Evgeny Voronov and Danilo Andusic. They brought the energy. They started to fight with full contact like we expected and the game turned a little bit. We started to believe more. The bad thing is that we lost Quino Colom. In the second half, Anton Ponkrashov played a good game and both Artem’s gave a lot of energy. But it is very difficult to come back when you play against CSKA. " "We were the better team, especially for three quarters. We were dominant. We came to a big margin, but we were kind of sloppy in the fourth quarter. But overall I have to congratulate my team. This is back to back EuroLeague [wins] and we’re still first, sharing the first spot. And we advanced to the playoff with home-court advantage. As I have said many times, this EuroLeague is a very tough EuroLeague. The games, the travel combined with the VTB League, it requires a lot of effort from all the players. The home-court advantage means less travelling, but it will be tough for all the teams. " "Tonight we just came on the court and did what we needed to do. We need to get ready for the playoffs and even if Unics had nothing to lose tonight, we knew it was going to be a tough game. When two teams from the same country play each other, it is always interesting. It wasn’t easy. We know they always play 40 minutes and never give up. That’s what happened tonight. "